Click here to order takeaway for delivery! We use the freshest ingredients to get the most authentic Thai taste. We source locally and seasonally where possible. The wine list has been chosen to offer something for everyone. You may like to try the Gewürztraminer with our spicier dishes. Thailand is called the land of smiles for a reason. SANUK: having fun in all that you do. Situated at The Cricketers, Cambridge, near Parker’s Piece. 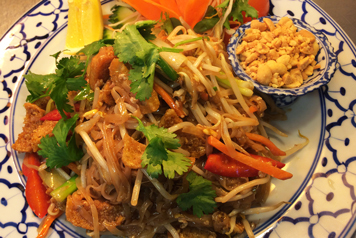 Luk Thai is set amid nice town houses and close to two other well-known pubs. Need we say more?! The legendary gaeng keow wan. 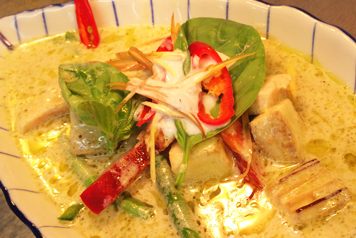 A hot curry made with coconut milk, Thai aubergines, Thai herbs and sweet basil. A classic. 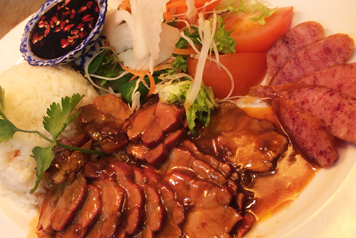 Thais love this dish with its sweet red sauce. The picture also shows Thai sausage on the plate which is not served as standard on the menu. Another well-known dish. Thick rice noodles with vegetables in a sauce. Done properly it should taste sweet, sour and spicy. The sourness comes from tamarind.